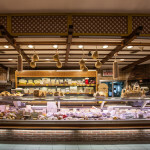 La Fattoria 1946 Occelli & C snc is responsible for the selection and sale of cheese and salami Italian, French, Swiss and Dutch, with particular attention to products originating in Granda Province. Founded in 1946 by grandfather nonno Lorenzo Occelli in Carrù, in the heart of the Langhe, was later transferred to Cuneo, then get to the final location of San Defendente of Cervasca, just outside the main town. The goal is to carry on the tradition of customer boards, authenticity and quality at the best possible price. To this end, suppliers are selected and contacted directly by us and produce daily food and fresh pasta. Welcome to La Fattoria 1946. 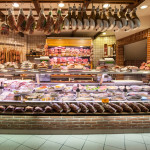 Following our exposure counter, we find: bread, pasta fresca, cheese, cold cuts, gastronomy , butcher, wine and packaged products, fruits and vegetables. Now we tell them but be warned: you will not resist the temptation! The Chef of La Fattoria 1946 produces daily traditional fresh pasta, following the recipes of Nonna Lena (Maddalena Occelli Revelli). From mixing the puff pastry to the filling, all procedures are carried out with love and professionalism. For our ethical choice, we do not use preservatives or thickeners. For the dough they use only organic eggs, flour type “00”, natural mineral water, extra virgin olive oil, salt. For fillings, the ingredients are coming from our shop including veal cuts, of course Piedmonts’ breed. Thanks to the pasteurization process, our fresh pasta has a duration of about 10 days. This procedure provides that the dough, after it has been produced, is passed through a mechanical roller inside of a pasteurizer that reaches high temperatures in a few seconds, killing bacteria and harmful organisms for the final storage of the product. Immediately after, the pulp is transported in a chiller that very quickly brings the temperature at about 2-3 degrees Celsius. Finally, all the dough is packaged in practical trays with modified atmosphere to ensure a lifetime of up to 10 days of production, without changing or crush the content, as it would instead using a vacuum. The bakery department welcomes every day freshly baked bread of the best bakeries in the area, sought by the “Pane dei tetti” of Dronero that lasts for several days and it is good to also be consumed as bread “stale”, the whole wheat bread, fat-free, to get to that classic like rosette, micche and biove. Personally we select cheeses from Italy, France, Switzerland and Holland. 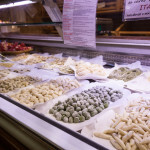 The forms of Parmesan cheese for example, are selected and marked one by one directly in the establishments in Emilia. In addition, we select the best DOC and DOP cheeses from the Cuneo valleys and national. Even the best and most genuine foreign cheeses have become part of our choice. 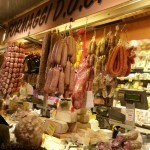 The meats proposed by La Fattoria 1946 comes mainly from the Piedmont, but also from other parts of Italy. Our strength is always to know how to recognize quality products and then be able to bring on your selected products and machined boards from trusted manufacturers. Our Chef, of twenty years of experience, has been able to mix their knowledge with the tradition of Occelli home, where the cookbooks “Langhe” (from the Langhe area, in the province of Cuneo) Grandma Lena (Maddalena Occelli Revelli) have always been the basis of our cuisine. Russian salad, of which we have a very special recipe, to whimsical, passing bagna cauda and anchovies flavored in oil parsley , garlic and pepper to get to the icing on the cake, our “Bunet Grandma” … all suggest authenticity. We are available all year round to study appropriate solutions to your palate. Gastronomy services of booking and personalized menus for your celebrations we are a custom culinary response and high quality. We deliver meals in comfortable baking trays with product ready to be reheated or eaten cold. During holiday periods -Easter, Christmas, New Year – we offer complete menus that you can book or order on time according to availability. And for those who want to enjoy a lunch break fast meal without sacrificing quality, we offer hot food takeaway and sandwiches, all while maintaining a high quality standard at reduced prices. purchase of calves. 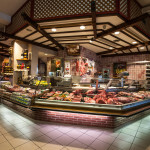 Our butcher meets all requirements: from the Fat Ox of Carrù, the Morozzo capon, Lamb Sambucano, the Piedmonts’ breed cattle. Every year we participate in the Fat Ox Fair in Carrù with excellent placings (final placement 2014 fair: second place). 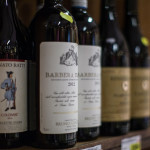 We have a wide selection of wines, spirits, liqueurs, spirits and beers from all over Italy and not. La Fattoria 1946 Occelli serves a range of classic products, including a selection of vegan, organic, gluten-free, lactose-free foods and other solutions dedicated to those who suffer from food allergies. Countless are the high-level solutions for taste, quality and price. We have a department of fruit and vegetables and we prefer local products, possibly seasonal and untreated. Most products come from a radius of 30 km, and for the most part these are small farmers who cultivate the land in a natural and organic way. Because of the growing demand of our customers , who want to share the quality of our products with their friends , we offer gift boxes – baskets , parcels , vouchers – that we can deliver directly to the receiver . The staff is highly trained and prepared to provide all the explanations of the origin of the products, their processing , preparation in the kitchen , the combination with other foods and wines , as well as the preservation of all purchases . Professionalism and courtesy characterize our daily commitment . Among our customers , there are bars , restaurants , hotels and farmhouses in the area too . To be closer to our customers we have chosen not to open multiple stores (which would inevitably lead to an increase in operating costs and thus to higher prices for our customers) but we opted to get closer to our customers through street vending . For over 50 years we are on the best places in the Cuneo area with a large truck traveling store to offer customers the same level of quality.